The first published map of the northwest coast to show Vancouver Island, the Puget Sound, and the Columbia River. 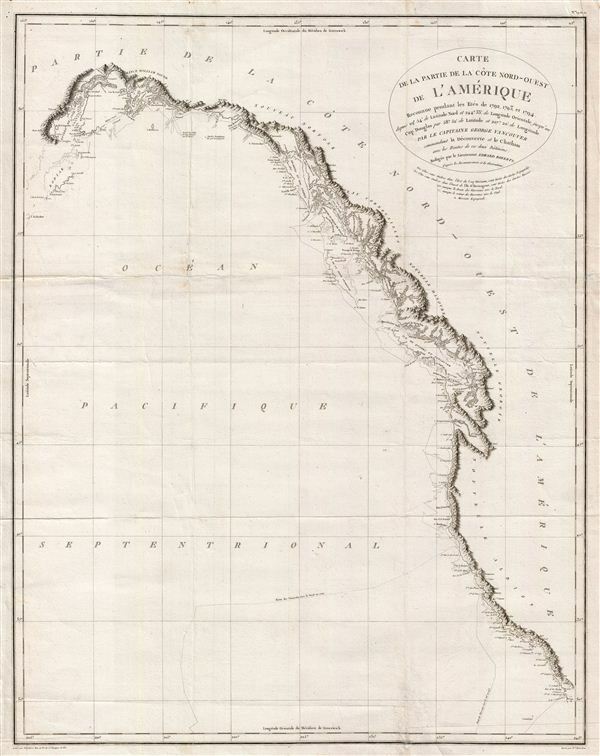 One of the great navigator George Vancouver's most important and influential maps, this is the 1799 general reconnaissance of the west coast of America from San Diego to Kodiak Island, Alaska. At last the west coast of America, particular the Pacific Northwest, appears on the map much as it is in reality. This beautifully engraved map features a number of notable firsts, including the first published mapping of the Puget Sound, the first mapping of Vancouver as an Island, the first mapping of the Johnston Strait, and the first published map of the Columbia River. Vancouver's mapping of the Columbia River, which he initially missed, was of crucial importance to the development of the western fur trade. Just five years after this map was published, Louis and Clark would consult this map when planning their own important overland expedition to American's west coast. The subsequent opening of the west to the fur trade heightened British and American rivalries in the region as well as ushered in the Great Age of the Mountain Men. Mount Rainier, Mt. St. Helene, Mount Baker are all noted, Baker being named after one of Vancouver's Lieutenants. San Francisco Harbor is noted as 'Port Sd. Francisco.' Slightly further north, Drake's Harbor appears. Here Sir Frances Drake supposed wintered in 1579 and in the process claimed the American northwest, as New Albion, for england. Vancouver's tracks in 1792, 1793, and 1794 are noted. The amazing detail of this chart, the finest mapping of the American west coast to appear for nearly 90 years after its publication, is an extraordinary monument to Vancouver's meticulous nature. This particular example of Vancouver's map was issued as plate no. 3 in the highly desirable 1799 French edition of Vancouver's Atlas. The rare and coveted French edition of Vancouver's Atlas is more beautifully produced with better engraving, higher quality paper, and more detail then the 1798 english edition. This scarce map is a core piece for any serious collection focusing on California, Vancouver, British Columbia, or the Pacific Northwest. Good. Some wear and soiling on original fold lines - especially at fold intersections. Platemark visible. Blank on verso. Rumsey 0233.004 (1828 edition). Falk, M.W. Alaskan maps, 1799-3 (1799 ed.). Wagner, H. R., The Cartography of the Northwest Coast of America to the Year 1800 (2 vols), 853-860. Falk, M.W. Alaskan maps, 1799-4 (1799 ed. ).